Twin Lakes and Cranberry Lake subdivision are still experiencing water issues related to the electrical outage. DPS is working hard to resolve these issues as soon as possible. Thank you for your patience. Over the weekend an electrical outage at one of our facilities caused Hurondale Booster Station, a backup water supply to start which has stirred up iron sediment in the Twin Lakes Village, Colony Heights, Sierra Heights, and Elizabeth Lake Rd. areas. While the plant did what it was designed to do which is prevent a loss of water pressure, the unintended consequence is rusty water. The water is safe to drink. There are no known health effects for iron in drinking water. It is unsettling to drink yellow or orange water which is why I have both of our operators out low flowing hydrants to try and flush out the suspended iron. Regular spring hydrant flushing was planned to start next week but we may move that up if we can’t get this to clear up. We’ve been working on this since Saturday. We appreciate your patience while we work on correcting the issue. White Lake DPS has experienced an increase in illegal fire hydrant use in our township. Illegal and unregulated connections can not only increase the risk of contaminating our water supply, but also lower pressure needed for fire protection. Improper opening or closing of a fire hydrant can cause widespread rusty water complaints or worse, water main breaks and serious property damage. Unauthorized use or theft of water costs more for everyone. Water theft from fire hydrants occurs most often when the user does not have a metered connection. To legally use water from a fire hydrant, the business or contractor must obtain a permit and meter assembly from DPS. The meter assembly includes a backflow preventer. If you see water being used from a hydrant without a meter assembly, theft may be occurring. If you suspect water is being stolen from a fire hydrant or identify a water meter that has been bypassed or tampered with, please call 911 immediately or email apotter@whitelaketwp.com. Tampering with the water system or using a hydrant without a permit is a misdemeanor offense. Twin Lakes, Cranberry Meadows, Ivy Glen, Autumn Glen, Parkview, and Whetherstone. Village Acres Treatment Plant will be offline for well cleaning. The project will start on 3-19-18 and is expected to be completed by 4-2-18. The 2017 Water Quality Report is now available. CLICK HERE or stop in to the White Lake Township Water Department to pick up a printed copy. White Lake Township Water Department is currently conducting Lead & Copper monitoring of our drinking water system. Due to the change in chemistry as part of our new iron removal facility, we are increasing the frequency of sample periods and the number of residential sampling sites to insure that our corrosion control is optimized. If you would like to participate in this important water quality process, please fill out the online form below or contact our office at 248-698-3300 Ext. 8. Your participation is greatly appreciated. 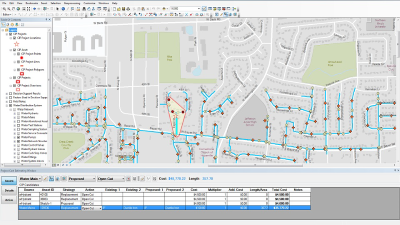 DPS has begun work on our GIS Mapping Program (Geographical Information System). This system uses precise GPS technology to aid in locating and maintaining utility assets, planning, and speed up emergency response. We will also be able to gather information faster and offer improved customer service. Your cooperation in necessary. Crews from White Lake Township and Johnson & Anderson engineering will be out locating and collecting GPS coordinates to precisely locate your water shut off valves. A blue water flag will be placed on the valve and removed a few days later when the information has been collected. If you have questions or would like additional information about our GIS program, please contact the Water and Sewer Dept. at 248-698-3300 ext. 8. The Village Acres Iron Removal Plant has been up and running since June of 2017. We are continuously testing water quality at this site and the water chemistry in the distribution system that it supplies. We are always looking for additional sampling locations. If you are interested in participating in water sampling, please contact us at 248-698-3300 ext. 8. Under the administration of the Township Supervisor, the Water Department is composed of four employees; this included (1) Director, (2) Field Technician and (2) Office Personnel. White Lake has provided water to the Township residents since 1980. We have 2,092 water accounts. It is the Water Departments goal to provide safe drinking water and fire protection to White Lake Township citizens. White Lake Township Water Department currently maintains 47.5 miles of water main. It is composed of 11 community wells, (2) one million gallon water towers, one booster station and 665 fire hydrants. We have added a 240 volt generator set, quick connect for a portable generator at Hillview Well House as well as backup generator sets at the Water office, and other key sites, like Aspen Meadows, Twin Lakes 1 and Village Acres. Repair and maintain water mains and related structures, such as towers, pumps, fire hydrants, get wells, water shut off valves and generator. Flushing hydrants twice a year. Meters updates to an automated billing system. Management of subdivision irrigation meters. Investigation of water service line leaks. Answer customer inquiries regarding rusty or cloudy water, low water pressure, water location, billing and fees. White Lake Township Ordinance 22 and the Department of Environmental Quality, through the State of Michigan, governs and regulates the water system.